People who are diagnosed as being in a “vegetative state” (PVS) are often warehoused in institutions. After a period of time a decision is often made to withdraw all treatment including the withdrawal of fluids and food to dehydrate the person to death. A few years ago I attended a European conference where presentations were made by physicians who operate medical treatment facilities to awaken patients through stimulation, known as awakening centers. The treatment stimulates the body to activate the brain and help it to heal. The story of Juan Torres, from Oakville Ontario, is significant. Torres awakened from a PVS state and improved beyond expectations. That Torres is speaking at all is astounding. Early one morning in July 2013, Torres, then 19, was discovered by his mother, face-down and unconscious on his bedroom floor, after choking on vomit in the night. He was left profoundly brain-damaged, and his doctors diagnosed him as vegetative: unable to speak, to eat, to deliberately control his movements, to follow basic commands. Vegetative patients retain their reflexes, and might grind their teeth or grimace; their eyes rove about the room but won’t fix on anything. They don’t demonstrate a glimmer of consciousness and can live that way for years, spending their days in hospitals, long-term-care facilities, or at home, unless families decide to end life support. The doctors who treated Torres didn’t think he’d be any different; they expected his status to be permanent, his mother says. Today—contrary to expectations—Torres is back home with his family. 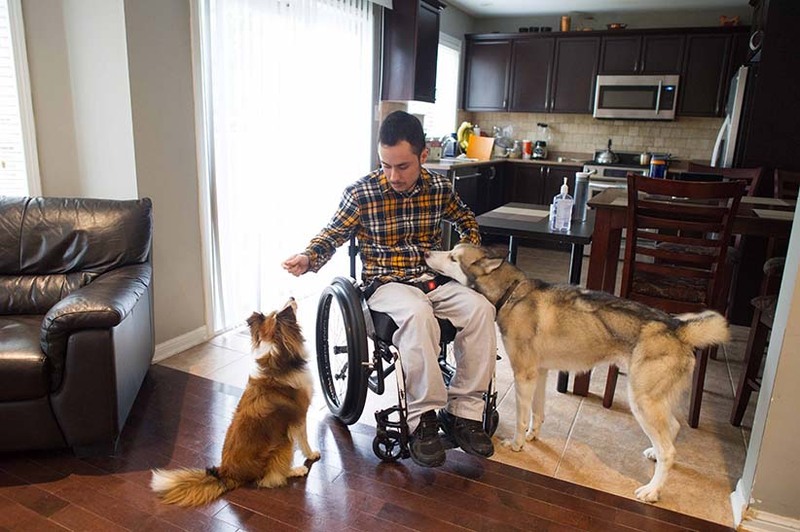 He gets around in a wheelchair; supported by his parents, he can take halting steps forward. In September, he started the general arts and science program at Oakville’s Sheridan College. If all this wasn’t unexpected enough, there’s something else about Juan Torres that has left neuroscientists stunned. Not only did he recover, but he claims to remember what happened while he was clinically vegetative—and he has memories to prove it. In those hazy months before anyone knew he was aware, Torres says he remembers a doctor telling him to squeeze his hand, even though he couldn’t. He remembers being asked to “follow a tennis ball” with his eyes. Scientists have tested his memories, asking Torres to identify a set of faces and objects he encountered while technically “vegetative.” And he was able to do it. “I felt sad, because I couldn’t communicate with my family,” Torres says. He felt scared and “emasculated” at his inability to respond to the doctor’s cues and commands. For Torres, it was a nightmare. “I felt trapped in my own body,” he says. “I couldn’t talk. I couldn’t react.” It was like being half-asleep and frozen, he says, unable to respond. Owen believes that Torres case is unique, but the question is, how many people are misdiagnosed? All neuroscientists, including Owen, agree that many—probably most—of the patients diagnosed as “vegetative” truly are so, with no hope of recovery. Certainly, the vast majority will never recover like Torres: there’s no doubt that this young man is an extraordinary case. “I’ve seen hundreds of patients over almost 20 years and he is completely unique,” Owen says. But the issue is, are we misdiagnosing a subset of patients as “vegetative,” and leaving these people to languish? It’s a chilling suggestion. About a month into their new reality, Juan Torres’s parents took him to a little garden outside the hospital to get some fresh air. He was in a portable hospital bed, unable to sit up. “We put him in the nice sun, and started to massage him,” Perez says. “I was talking about how white he was getting.” His fair complexion has always been a running joke with his family members, who call him Snow White. “We are all kind of tan, and he’s the only one with white skin,” Perez says. Torres was “unconscious,” she continues, but he started laughing along at the joke. They immediately reported this to doctors, who, once again, deemed it a reﬂex. “I couldn’t believe it. We were talking, it wasn’t random,” says Perez. Even so, vegetative patients do show automatic responses that can confuse and alarm loved ones. It’s not unusual for family members to interpret these as signs of consciousness, when it could just be wishful thinking. “I started to wonder if I was seeing something that wasn’t there,” Perez says. Researchers, working with Adrian Owen’s became involved with Torres. The family didn’t give up. Not long after, on Thanksgiving, Torres’s family brought him home for a day visit, his first since leaving in an ambulance three months before. As his parents carefully wheeled him into the backyard, the family dogs, Yogi and Cindy, came bounding out to greet him. His father, somehow intuiting on behalf of his son, grabbed a dog whistle and stuck it between Torres’s lips. And Torres did what no one had thought possible: He started to blow. Not long after, the team at Western phoned Perez. “As we were explaining the results,” Gonzalez-Lara says, telling Perez that tests indicated her son was clinically vegetative, “she told us, well, he just started talking.” Soon after Thanksgiving, Torres had begun mouthing words, then whispering. He gradually regained his voice. That November, he was discharged from hospital and sent to a rehabilitation centre. Torres went back to London Ontario where they began to test his memory of being PVS. They showed Torres photos of people he’d met on his initial visit, when he was still clinically vegetative, mixed in with photos of others who looked similar, but whom he’d never encountered. They did the same with objects, including two hand mirrors, one framed in red, the other in white. Torres correctly identified all five faces, and three of the four objects. (Findings will be published in a future scientific paper.) Seeing a photo of Laura Gonzalez-Lara, the research coordinator whom he’d met while vegetative, he said: “That’s Laura.” About another person, he said, “I recognize her nose.” And in still another example, he described the voice of a person he’d met as “deep and monotonous,” a description so bang-on, it made the others laugh. The more patients he scans, the more he discovers about the wide variety who are labelled “vegetative”—and the possibility that some aren’t vegetative at all. Shortly after being recruited to Western in 2010 (Owen holds the Canada Excellence Research Chair in cognitive neuroscience and imaging), he met Scott Routley, who had been in a car accident 12 years before that left him in a vegetative state. In a brain scanner, Routley could answer “yes” and “no” by activating parts of his brain on command. Owen asked whether he was in pain, and Routley answered no, a first for any vegetative patient. Juan Torres is another first. Whenever Owen discusses his work, he hears the same question. “Someone will put up his hand and say, ‘Do you have a patient who recovered and can tell you [what it was like]?’ ” Owen’s team has determined that one in five patients who appears to be vegetative retains some level of consciousness, which can’t be detected through standard clinical assessments. The number could go up, he argues, as detection methods improve—but even with a growing body of research, it remains controversial to claim consciousness among these patients. Some worry it could give families false hope, or cause feelings of guilt among those who do decide it’s best to end life support. Torres says he feels pride at his recovery. “I learned a lot, actually,” he says. “I used to get mad. Now I’m more patient.” But a sense of loss hangs over him. A focused and determined young man—his recovery is no less a testament to his own resolve, and his family’s—his frustration can at times be palpable. His life has swerved down a path he never could have predicted. But he’s back in school. He’s playing sports, including wheelchair rugby. (He enjoys “the competition,” he smirks. “The violence.”) Torres spends spare hours making electronic music on a laptop at home. He dreams of becoming a platinum-selling record producer. In 2004, after attending the European conference I stated that awakening centers need to be established in Canada. For those who are reading this article and have a family member who is PVS, try to stimulate the brain, as the family did for Torres. There is nothing to lose.